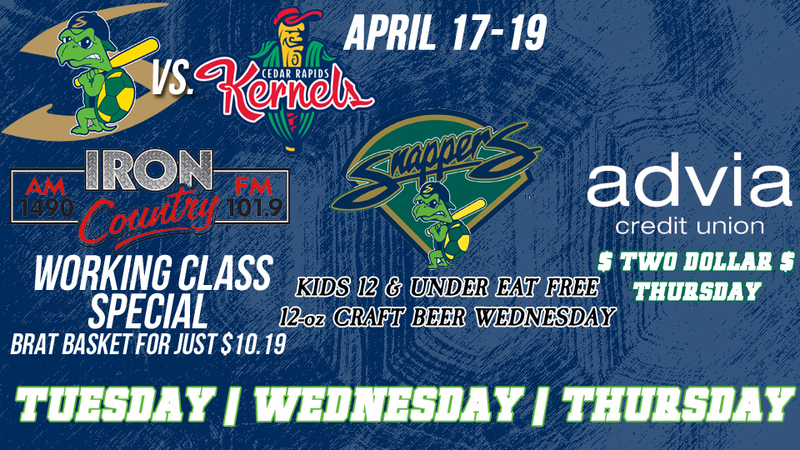 The Beloit Snappers conclude their nine-game road trip with a three-game set with the Kane County Cougars this weekend before returning home to Pohlman Field next week. The team will return home, Tuesday April 17th for a quick three-game homestand against the Cedar Rapids Kernels. Tuesday April 17th will be the first Working Class Special promotion of the year, followed by a Kids Eat Free and Craft Beer Wednesday and the series will wrap up with a Two Dollar Thursday. just $10.19 from your friends at 101.9 Iron Country Radio. WEDNESDAY: Kids Eat Free - Kids 12 and under will receive a hot dog and soda voucher to be redeemed at the main concession stand. Craft Beer Wednesday - All 12-oz. craft beer drafts are just $2. drinks can be purchased for just $2. Presented by your friends at Advia Credit Union. Cedar Rapids roster features top Minnesota Twins prospect, infielder Royce Lewis, and outfielder Alex Kiriloff. Single-game tickets start as low as $6.50 in advance, and fans are encouraged to purchase 15-game packs to save money for multiple-game use this season. All ticket packages of 15 games or more guarantee fans all of the 2018 promotional giveaways including our three bobblehead giveaways!